I wanna share my customized Ferrari 312T! Pratically I just put my name and my race number. I know this is just a personal skin and nothing original. But sharing is free, so I wanna do! 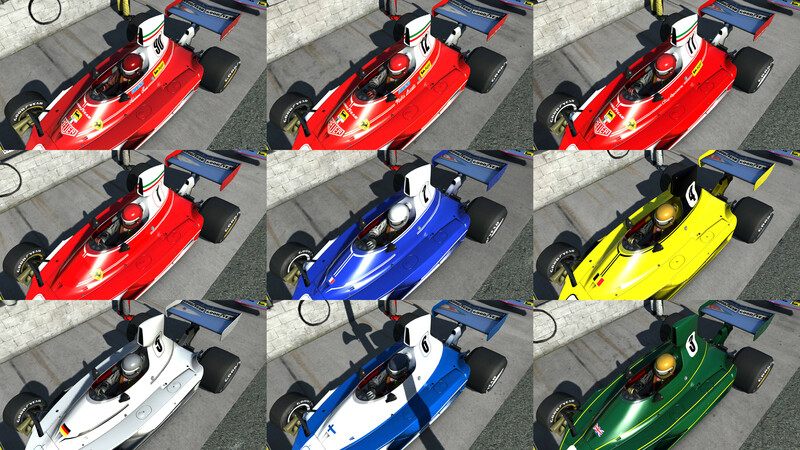 I "recycle" this skin's file to host a skin pack for all Ferrari 312T drivers starting from AC 1.5. As you may already know, form AC 1.5 Kunos introduced a new driver model with new textures... but actually they made no ingame texture for it! So all drivers of all cars have just white suit and gloves. While helmets are not new in AC 1.5, strangely all Ferrari 312T have no personal helmet skin (except the generical base red). Well this "additional pack" simply introduce coloured gloves, suits and helmets for each car color (aka: all red cars will have the same... except mine). New textures are inspired to official Kunos skins from AC 1.4 drivers and previous, so they actually also adapt to all other Ferrari models in the game (except helmets, which are 70s'). Note: maybe this additional pack will became useless in AC 1.6, if Kunos will finally introduce their own official skins for drivers. Currently they override NO official texture file at all: they are all additional files. - New customized livery, similar to base Ferrari skins but personalized. - New driver's suit and gloves. Compatible with new AC 1.5 driver model, for my customized livery. - New driver's suit and gloves. Compatible with new AC 1.5 driver model, for ALL Kunos skins, too. - Zip file name changed. Unzip the file in "Steam\steamapps\common\assettocorsa\content\cars\ferrari_312t\skins" where "Steam" is Steam's installation folder. It should create a new folder called "serio_ap". Note: sorry, from this angle you cannot see suits' customized secondary color and logos on shoulders and stripes. karina-moskva, jerry090460, Phil Davies and 1 other person like this.